This Historical Analysis Suggests S&P 500 To Top Out at 1400+ – and then Topple to 400! Market strategists Sadiq Currimbhoy, Arik Reiss, and Jacky Tang of Bank of America Merrill Lynch Asia identified a pattern** back in 2009 that supports the likelihood of additional gains in the S&P 500 regardless of the extent of the extent of the economic recovery in the U.S.. 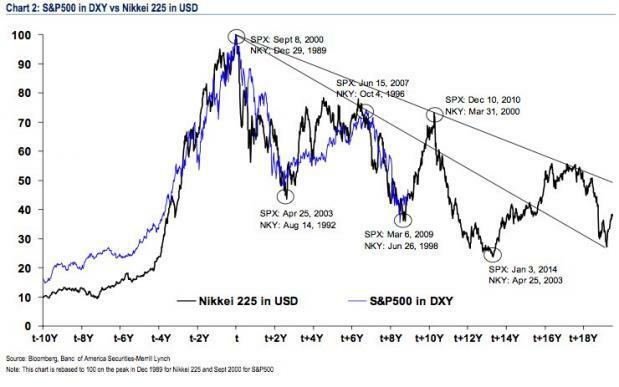 The analysts plotted the S&P 500 in DXY terms against the Nikkei by rebasing the S&P 500 to the same peak as the Nikkei but lagged by 117 months (i.e. 9.75 years) and uncovered an uncanny relationship as shown in the chart below. Their analysis suggested that the S&P peak would be achieved by December 10th of last year but that obviously was not the case. Failing to achieve such a precise projection can be excused so the realization of such a target in the first half of 2011 should be deemed acceptable. Doug Short does an on-going (***see below) inflation-adjusted overlay analysis of the Dow in of 1929 and the Nikkei 225 from its 1989 bubble high against the current S&P 500 as seen below. It clearly suggests, even without the 9.75 year time-lag as put forth by the Merrill Lynch analysts above, that the S&P 500 is due for a significant correction. The Merrill Lynch strategists went further, constructing an equally-weighted index of all markets that have crashed more than 45% since 1970 plus the U.S. stock market crash in 1930 and then averaged the recoveries from these crashes (referred to as ‘Historical Peak-Trough Index’). This is shown in the chart below with 25% and 75% bands. When the Historical Peak-Trough Index was compared to markets that have recently experienced similar deterioration (referred to as ‘Current Peak-Trough Index’) they concluded that the current S&P 500 index looks like it’s following a similar pattern that would have the S&P 500 topping out at somewhere around 1400-1500 (i.e. 5-10% less than the S&P 500’s record high of 1565 in October 2007) before crashing back to it’s 1994 low of 400 (when the stock market bubble first began) by the end of 2013 or early 2014. The Merrill Lynch Asia strategists maintained that the rally in the S&P 500 would likely be triggered by central bankers keeping interest rates low (they have), an economic recovery (slowly underway) and/or an undervalued dollar (which has turned out to be the case). Their analysis, and the current charting by Mr. Short, bear scrutiny and ongoing review for us to successfully navigate these troubled economic/financial/investment waters.